This Festschrift is dedicated to Professor Tarmo Kulmar on the occasion of his 65th birthday. The volume contains 23 papers from Tarmo Kulmar’s friends, colleagues and students. 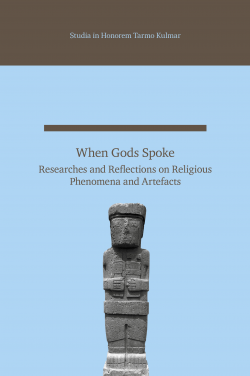 The papers cover quite an extensive field of religious studies from archaeology and source text analysis to modern religious trends, politics, and the methodology of religious studies. All these are areas to which Professor Kulmar has contributed a great deal over more than 40 years of academic study. * Peeter Espak: Was Eridu The First City in Sumerian Mythology? * Jaan Lahe: Mithra in Kleinasien und Mithra(s) im Römerreich: Sind die römische Mithras-Mysterien in Kleinasien entstanden? * Ain Riistan: Mark 8:22–26: What Do We Make of a Jesus Who Spits?